Let’s be real: alcohol isn’t exactly health elixir. The ugly truth is that alcohol can’t exist without calories. I know, sad… but true. Just because calories are inevitable in your favorite brews and cocktails doesn’t mean you have to give them up for good. Because the truth is (at least in our opinion), there’s nothing better at the end of a long day than rewarding yourself with a cold, frosty glass full to the brim of your favorite beer. But if you’re concerned about calories, educating yourself on what options are available is a great place to start. Even making small changes in your beverage selection can help ensure your after-dinner drink doesn’t end up on your waistline. We are our choices, after all. So, how do you know which beverage packs-in the most calories? First off, the type of alcohol doesn’t make a difference necessarily in the amount of calories you’re taking in. Surprisingly (we were shocked too!) a serving of beer isn’t more likely to pack on any more pounds than liquor or wine, especially when we analyzed per ounce. Calories in Alcohol: What Are You Really Drinking? 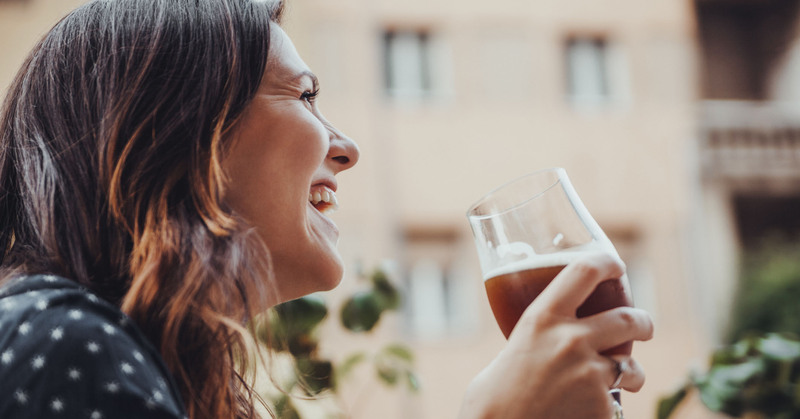 When it comes to beer, most people automatically assume that it has the highest amount of calories—but that’s not necessarily the case. Out of all of your many alcoholic beverage options, beer has the fewest amount of calories per ounce. A lighter beer – typically between 103 – 112 calories per 12 ounces. Spirits: rum, vodka, tequila, whiskey, gin and brandy—65 calories. But lookout for those high sugar mixers that can add on more calories. 1) If you choose a spirit, try to mix with a bubbly, low-calorie drink like soda water. The bubbles help you feel full and adding a slice of orange or lemon you have a tasty low-calorie cocktail! 2) Lighter beer. A 12 or 16oz beer can give you a full party in a glass! This should be enough drink to last you a couple of hours. Also, depending on your beer selection, it is probably lower in calorie per serving than most other options! 3) Champagne, Red and White wine – careful on the serving sizes, if you’re like me and channel my inner Olivia Pope after a long day of work, these 5oz serving sizes double (or triple!). If you choose this beverage, be sure to stick to the serving size. You don’t have to feel guilty after knocking a few brews back. The Greatist breaks down the 9 healthier beers and how to choose the right one! Now, you can drink wisely without gaining weight. Cheers to being a smartypants!